I know that you’re all probably thinking, what does an “empty-nester” know about being a busy mom? Well, let me tell you, I do remember, and it’s hard! I know that having go-to Meal Ideas for Busy Moms is a good idea!! I was blessed with being able to be a stay at home mom with my girls. I’m not judging nor do not I want to get into a debate on working moms vs. stay at home moms. It was a choice we made as a family, I wanted to stay home, and fortunately we were able to make it on one income. But it was still hard. Being at home meant that I had the time to do more volunteering at my child’s school, be room parent, soccer mom, sew the homemade costume, be on the PTA board, drive on every field trip, host play dates, etc, etc, etc. All of those extra activities filled my days and there were plenty of days where I didn’t have enough hours to get it all done. And get dinner on the table? Are you kidding me?? I can’t do that, I have to drive across town to drop off for dance, then race back to pick up from soccer practice. No doubt about it, I practiced what I preached about Meal Ideas for Busy Moms! I miss those days! Seriously, like I’m almost in tears remembering all those crazy days with my three girls (now 33, 31, and 28). If I could do it all over again, I would, and I wouldn’t change a thing!! I’d love to be back in the chaos of costume making, cooking baking, and carpooling. Planning fund raisers, birthday parties, and soccer parties don’t sound so bad right now. And those were just the elementary school days. It continued to get busier as the girls got older. Competitive sports, intense homework, and dance competitions filled our weeks months years. Again, get dinner on the table? Are you kidding me? I can’t do that, we have to go prom dress shopping! The girls were growing up, but the busy-ness continued: SATs, college applications, more basketball tournaments, heart aches and breakups, my days were still full. PTA soon got replaced with college tours. Slumber parties became after prom parties (which by the way need a lot more supervision). They learned to drive, they got grounded. They fell in love, they got engaged. And get dinner on the table? Are you kidding me?? I can’t do that, I have a wedding to plan. Wipe away the tears and fast forward. I have three grown daughters. My oldest two are married. I have 5 grandchildren. I still love my husband. I am truly blessed! I felt I needed to share the above with you so that you’d understand, that I do understand how crazy life can be. And get dinner on the table? Are you kidding me?? Yes, I can, I do have the time for that! Here are a few of my tips/ideas/suggestions to make your meal planning a bit easier and hopefully a little less stressful. •Sit down on Monday morning and look at your week’s calendar. Are there meetings or events late afternoons/evenings? What nights is everyone home for dinner? What days do you have a little extra time to plan a dinner that takes a bit more time? Once you know what your week looks like, you can make your weekly menu and then your shopping list. I typically planned dinners for at least five nights (this allowed a leftover night, take out night, or going out night. You have to remember that I was raising our family before the use of iPads and fancy computers. Cookbooks were actual books. There was no Pinterest for inspiration. Just me and simple piece of paper. I’d often thumb through cookbooks, or dig through recipes files, but with a young family, we ate pretty basic. I knew what they liked, I knew what they’d eat, and let’s face it, when life is busy the last thing you want is for dinner time to be a struggle. My plan was to cook balanced meals, knowing that “most” everyone would eat everything (or at least take their required # of bites). I’d write up something that looked kind of like this every week. I’d always magnet it to the front of the refrigerator. We knew what to expect and I knew what to shop for. Today’s inspiration would look more like this. 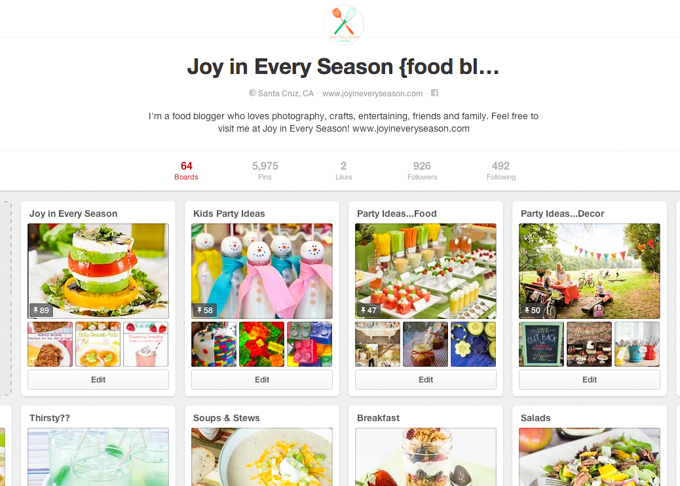 We’d go to our Pinterest Board, or maybe Yummly, or StumbleUpon. I know that life is a little different these days (not busier, just different). More moms work outside the home and are reliant on the second income. If you’re unable to do your planning as I did every Monday morning for years, choose a day (Sat. or Sun.) that works best for you. •I used to love to let my girls pick a night of the week to help decide “whats for dinner.” My only rule is that it had to include something from all the food groups (meat, starch, salad or veggie for example). And they couldn’t choose the same thing the following week. They loved when it was “their dinner” night. •Make your menu, groc shop, and do any prep that you can on whatever day works best for you. •Incorporate the use of your slow-cooker and oven’s auto on/off more often. •Plan multiple meals that include some of the same make ahead prep. You have to figure out what works for you and your family. Here are a few ideas to make your meal planning a smidge bit easier. 1)Bake a sheet pan full of whole chickens (3-4) or double breasts, skin on (6-8). See my Roast Chicken Recipe here. For the breasts, I cut a few lemons and put them in the pan first (drizzled with olive oil), then placed the chicken on top. I pulled back the skin on the chicken breasts and shoved some herbs under the skin. I drizzled olive oil on top and added salt and pepper. They roasted at 350* for approx 45 minutes. Time will depend on size of chicken breasts. For the whole chicken, I filled the cavity with a whole head of fresh garlic (cut in half but not peeled), lots of sliced lemon, a half of red onion (quartered), and a few sprigs of thyme & rosemary. Drizzle the top with olive oil and sprinkle on some salt & pepper. My chicken was only about 3 1/2 lbs. I roasted it at 350* for about 45 minutes, then increased the oven to 450* for another 15 minutes. Again cooking time will vary depending on size of chicken. Juices should run clear when cut into. When the chicken is cool enough to touch remove all the meat from the bones. I typically shred some and cube some. Place into zip lock freezer baggies. Make a chicken meal the day you cook the chicken, and freeze the rest. The frozen chicken (thaw in ‘fridge overnight), can be used for enchiladas, soups, pasta dishes, quinoa bowls, chicken salad, and the list goes on. 2)During the summer, when your garden is abundant and you have a lot of fresh basil, make Pesto. Make a lot of it! I make it and freeze it in ice cube trays. Once frozen I place the pesto cubes in a zip-lock freezer bag. Pesto is great in pasta and our family also loves it on garlic bread. And how about adding some to your scramble eggs? There are so many uses for pesto. 3)Spaghetti sauce (the old standby). Make a huge pot (with or without meat, however your family prefers it). Enjoy it for dinner that night, then freeze the rest. Weeknight dinners will be easy when you have fresh sauce to top some quick cooking pasta. Another idea, is to make multiple pans of lasagna or ricotta stuffed pasta shells, then freeze those. A quick salad, some garlic bread and dinner is made. Speaking of garlic bread, if you’re taking the time to make one loaf, why not make 3 or 4 and tightly wrap them in foil and freeze them for a busy weeknight meal. I’ve realized I’m giving you lots of freezer tips, which really wasn’t my intent when I started this post. And funny thing is, I’m typically not a fan of freezer foods, but these work. And they work well. As long as they’re well wrapped (I use lots of foil and zip-lock freezer bags), the food will be fine. These are all foods that I make and freeze successfully. And one more freezer tip. Fruit! We love Smoothies, and having frozen fruit ensures a thick smoothie and also eliminates ever throwing out fresh fruit if it’s getting too ripe. I’ve always frozen bananas and berries, but I’ve recently started freezing just about any fruit that we have too much of. Pineapple, melon, and even left over fruit salad go into freezer bags. I hope you’ll find a few of my meal planning and freezer tips to be helpful. If one little tip is helpful in relieving some dinner time stress, then I’ve done my job. I truly believe that family dinners are important. They’re a time to share your day (the big events and the small) with your family. A time to communicate (put away your phones), and enjoy a few family moments chatting about your days. It truly is the small moments in life that your children are going to look back on and remember. I don’t know about you, but I’m glad that my children remember that dinnertime was an important family time. If you liked this post, please let me know and I’ll do a follow up with more ideas, recipes, and tips. What a great post Renee, great tips, once you get a little organized it goes a little smoother, and for sure you should share more tips. Thank you for sharing your very wise suggestions. We can all be more organized. Even though my kids are all gone I still find the need to write things down and plan ahead. Otherwise I don’t get a thing done. Have a great day. Great tips! I kinda miss those days too now that my boys are grown and flew the coop…except I have one home for a short period and get to spoil him rotten at the moment! Being at home five days a week with my one year old sweet boy, I am in constant need of meal planning. I might have only a short window of time to cook dinner for the three of us, so this would eliminate the last-minute frustrations of “Oh crap, what am I going to make tonight? 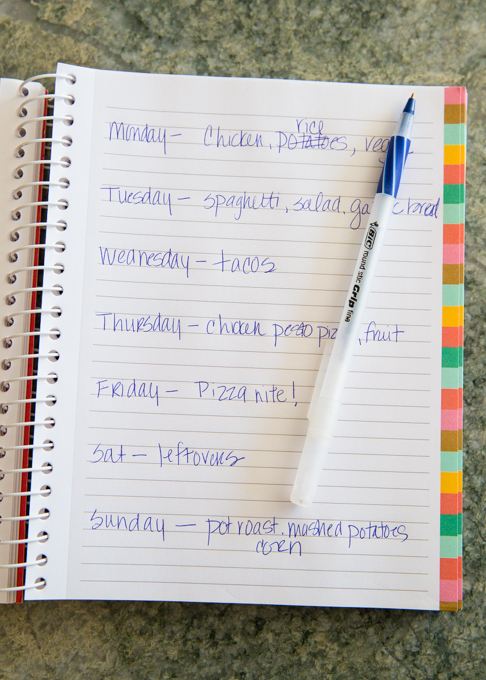 !” These are great strategies for organizing the week’s meals. Thanks for the inspiration! I love this Renee! Thanks for sharing – even though I’m not yet a mom, I still feel like this kind of organization is exactly what I need to keep our very hectic life in order. 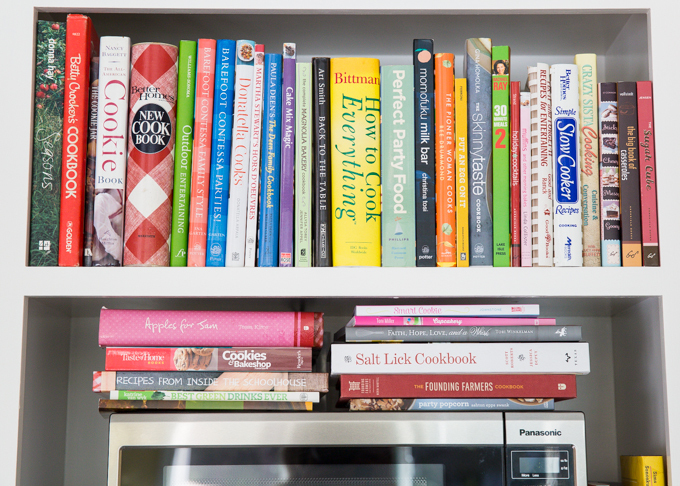 I also had fun looking through your cook book collection and finding all the ones we have in common – I am obsessed with cook books! Great information for even busy dads to use! I’m always making meals ahead. I used to make up 10 meals at once and then freeze them in containers, so all I had to do was defrost and heat. It made those busy work nights so much easier when my kids were growing up. Love these ideas Renee! 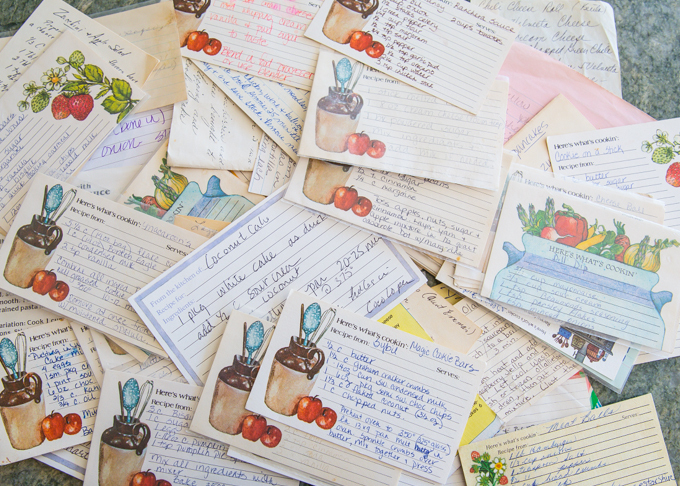 The pile of recipe cards reminds me of the weekly menu planning session here! Great tips! This post really hits home with me. I have 3 little ones and often feel like it is just too crazy to cook. I definitely need to get better at meal planning so thank you for the tips. Love your site! Great meal planning tips. Thanks for sharing! As a mother of a stubborn and energetic 4 year-old it’s encouraging to hear that you miss the busy days of when your girls were young! I use a similar method of meal planning as you did. I write out my menu and then it goes on the fridge. It helps me to stay in budget at the grocery store by not over buying and it solves the question of “what for dinner?” The answer is always, well go look at the fridge. Until recently I worked full time, so I’d quick check my menu before heading out in the morning to make sure everything I needed was out of the freezer, and then when I got home I didn’t have to over think dinner. It help to keep my stress levels down. I like your idea of let your kids pick a meal one night a week. I think I’ll implement that. Thanks for sharing! I am not a parent, but I have been meal planning for years and am obsessed with it! It’s the only way I get by during the week without ordering delivery or picking up something on the way home! Keeps me on track with my diet and saves money too! Great post with a lot of great take home tips!! Love all the meal time tips. I always try to keep some friendly freezer main dishes. Can be a life saver on hectic days. What great tips! We don’t even have kids yet and life is just so crazy! You are a rockstar to fit all of that in! I love the idea of letting the girls help choose dinner (and the rules that were set forth for that). I would have LOVED to do that as a kid!! Loved your post and your collection of ‘Cook Books’ look so impressive. I so agree with plan ahead meals. Brilliant ! 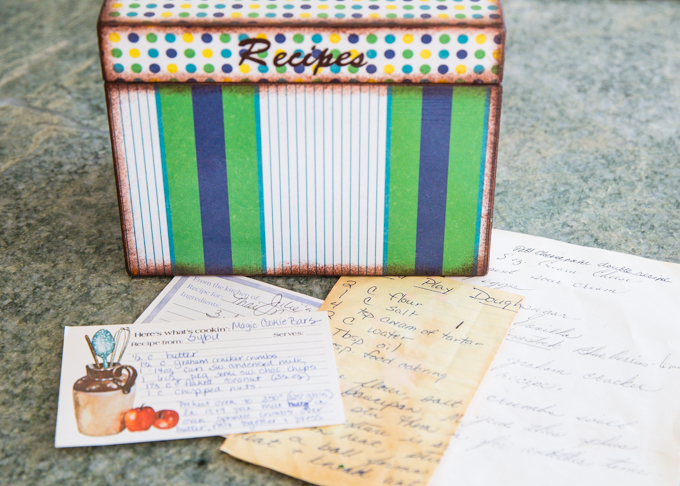 And those recipe cards ? So nostalgic and beautiful, love it ! Renee this post is especially great from young mothers. Thanks for sharing, organization is the key! These are fantastic tips! Thanks for putting this together.